A scheme allowing thousands of East European migrants to work on British farms is to be closed at the end of the year, the Home Office said. 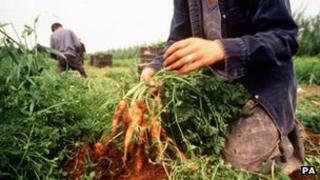 About 22,000 Romanians and Bulgarians are employed each year under the seasonal agricultural workers scheme. But it will close when labour market curbs for workers from those countries are lifted at the end of 2013. The government does not intend to open a new scheme for workers from outside the European Economic Area (EEA). Home Office Minister Mark Harper said: "At a time of unemployment in the UK and the European Union there should be sufficient workers from within those labour markets to meet the needs of the horticultural industry." A report by the Migration Advisory Committee earlier this year warned scrapping the seasonal workers scheme could also trigger a surge in labour costs and ultimately higher prices for fruit and vegetables. The government's migration experts said they did not expect a shortage of labour on farms in the short-term but shortages could develop after two or three years. It was difficult to predict whether Bulgarians and Romanians would continue to seek work on British farms when they were able to apply for any job in the UK without restrictions, it added. But Bulgarian officials told the Department for Work and Pensions they do not expect there to be substantial reductions. The report also says it is unlikely British workers will make up the shortfall, due to low wages and the nature of the work. Responding to these concerns, Mr Hoban said: "We do not think that the characteristics of the horticultural sector, such as its seasonality and dependence on readily available workers to be deployed at short notice, are so different from those in other employment sectors as to merit special treatment from a migration policy perspective." The move was welcomed by campaign group Migration Watch. Chairman Sir Andrew Green said: "This decision has to be right. We now have a labour market of 500 million in the European Union, it simply makes no sense to bring in unskilled workers from outside. "This decision is a welcome indication that the Government is serious about reducing immigration. It can only be helpful to the young British workers seeking their first job." But farmers' groups warned closing the scheme could lead to higher fruit and vegetable prices. The British Growers Association is seeking an urgent meeting with ministers to understand how the government intends to work with the sector. BGA chief executive James Hallett accused the government of ignoring the advice of its own advisory committee to consider setting up a replacement scheme targeting workers from non-EU countries such as the Ukraine. He said the government's decision could "have a significant and damaging impact on investment and production decisions affecting the UK with immediate effect". Meurig Raymond, deputy president of the National Farmers' Union (NFU), which represents 47,000 farmer and grower members across England and Wales, said: "Our grower members will be rightly outraged at this decision by the immigration minister which will have a devastating impact on the horticulture sector in the UK. "This decision completely contradicts David Cameron's belief that farmers are the backbone of Britain and the recommendations of the Migrant Advisory Committee that horticulture would suffer immeasurably without access to a reliable, flexible and consistent source of migrant seasonal workers."